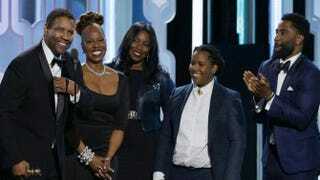 Denzel and Pauletta Washington with their children durng a presentation at the Golden Globe Awards on Jan. 10, 2016, in Beverly Hills, Calif. When you have as much star power and influence as Denzel and Pauletta Washington and it’s put to good use, amazing things happen. While Barack Obama was giving his final speech at the White House Correspondents’ dinner Saturday night, the Washingtons were throwing a lavish party with some of Hollywood’s biggest names, all in support of the Smithsonian National Museum of African American History and Culture, which opens later this year. The fundraiser was an effort to secure the final monies needed for the museum, and needless to say, when the Washingtons put out a call, their friends have no problem donating. The museum’s total cost amounts to $540 million, and so far the government has contributed $270 million, with the remainder coming in from events like the Washingtons’.